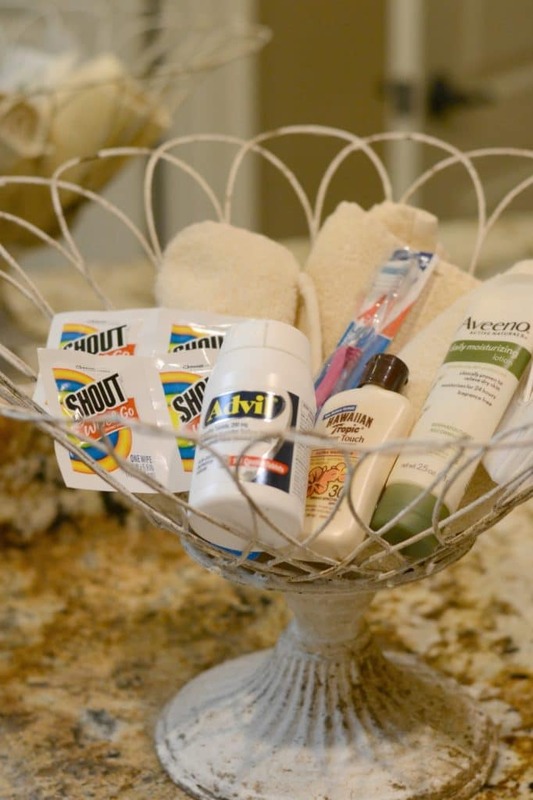 If you’re hosting overnight guests in your home, of course you want them to feel welcome and comfortable! Here are my tips and ideas for creating an inviting guest room space that feels like a retreat instead of an afterthought. No matter how large or small your guest space is, there are many things you can do to make it feel cozy and welcoming. 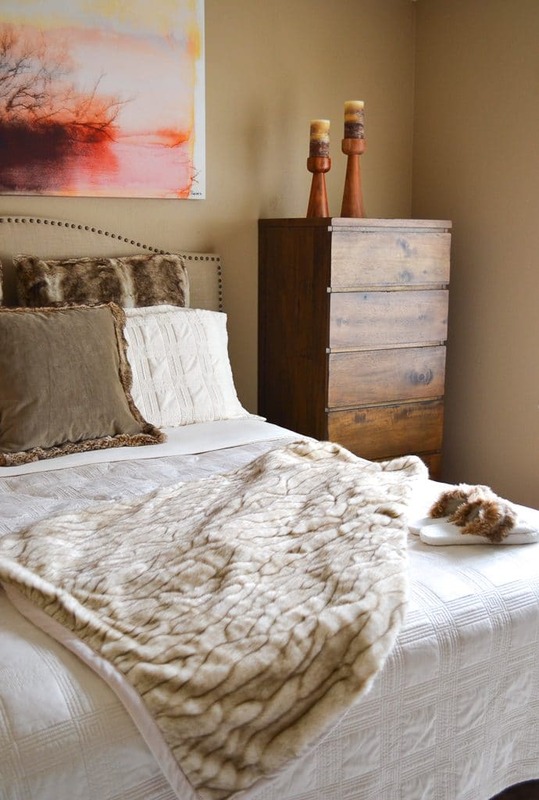 Below, I am sharing a list of guest bedroom basics and essentials as well as some additional touches that you can add to make your guest room even more luxurious. These are “must have” items that every guest space should have. Even if you’ve got a small guest bedroom, or a guest room that doubles as an office or playroom, you can easily include all of these essentials to make it feel homey and comfortable. This one’s a no brainer. 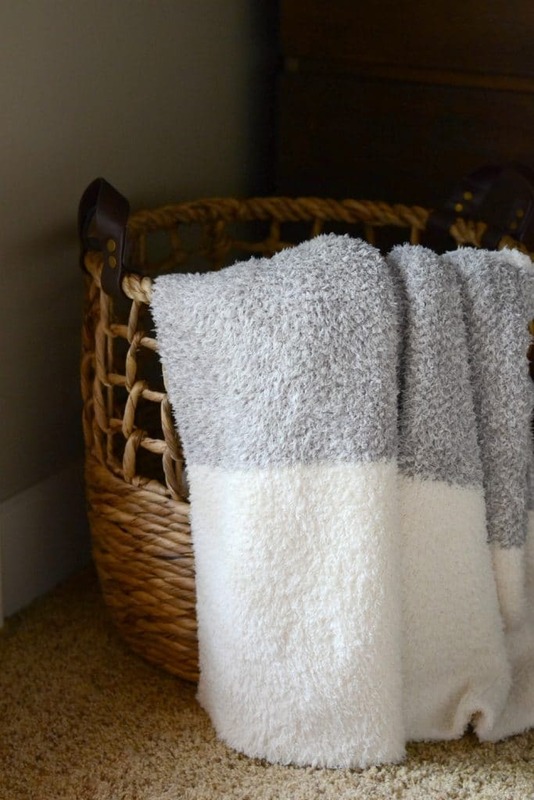 Make sure you’ve got a fresh set of towels ready for your guests to use when they arrive. They don’t have to be expensive, just soft and clean. Stock your guest space with some bottles of water, or if you want to get a little fancy, fill a cute carafe or pitcher with filtered water, and have it waiting on the bedside table with a clean glass. If you don’t spend a lot of time in a guest room, you might not be aware of how much light gets in each morning or night. Nothing is worse than being woken super early by harsh light streaming in through a window. If the room gets a lot of light, consider adding a blackout shade to help block it out. You never realize how much you rely on a bedside clock until you find yourself in a bedroom that doesn’t have one! 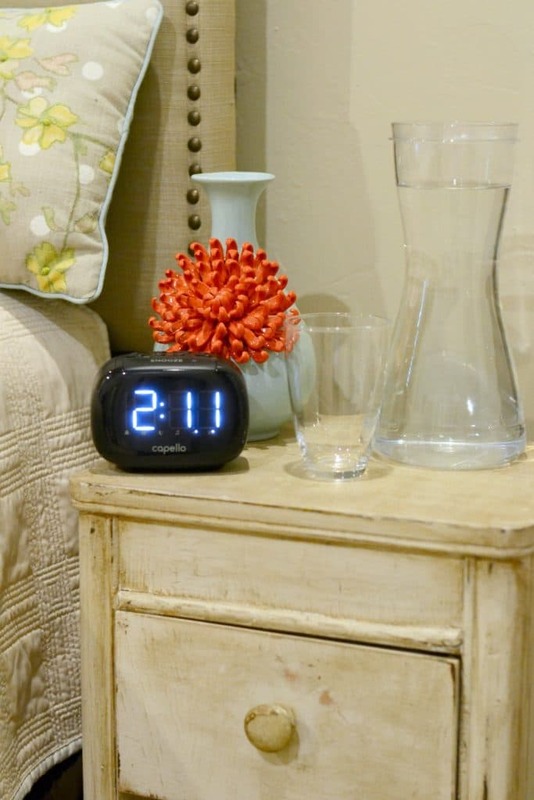 Invest in an inexpensive alarm clock to keep on a bedside table. Not everyone likes to sleep with a night light, but it’s nice to have one as an option for those who do, especially if your guests aren’t familiar with the layout of your house. Also make sure there’s dim lighting in the hallways in case your guest wakes at night to use the restroom, etc. Everybody has *something* that they like to drink first thing in the morning. Whether it’s coffee with cream and sugar, hot water with lemon, or juice, make sure to find out what your guests prefer and stock up on it before they arrive. Whenever we’ve stayed at a hotel or rental property on vacation, one of the things I miss most is having a soft, cuddly blanket to curl up with on the couch. Maybe it’s not something everyone likes/needs, but for me it’s a total essential. Before your guests arrive, be sure to stock the bathroom they’ll be using with extra toilet paper, and show them where it’s located (if it’s not in an obvious location). Your guests will appreciate having the info at their fingertips without having to ask! Now that you’ve got the essentials covered, here are some extras that will take your hospitality to the next level. It’s nice for guests to have somewhere to place their dirty clothes besides their suitcases or the floor. Placing a small hamper with a lid in the closet or bedroom is a small touch that will be very appreciated. I’m notorious for forgetting essentials like my toothbrush whenever I pack for a trip. For that reason, I’ve put together a box of extra new toothbrushes and sample size toiletries (toothpaste, floss, lotion, cotton balls, q-tips, etc) that guests can use if they need anything. It’s also a great idea to include a hair dryer so that guests don’t have to bring their own. Ibuprofen, band aids, and other first aid items are also a nice touch. Again, just as with a night light, some people do not use white noise machines when they sleep, but it’s nice to have one available, especially if you’ve got young kids or pets in the house. At my house, there are some birds that get overly chirpy around 5:00 a.m., so I want my guests to be able to block out the sound with white noise. 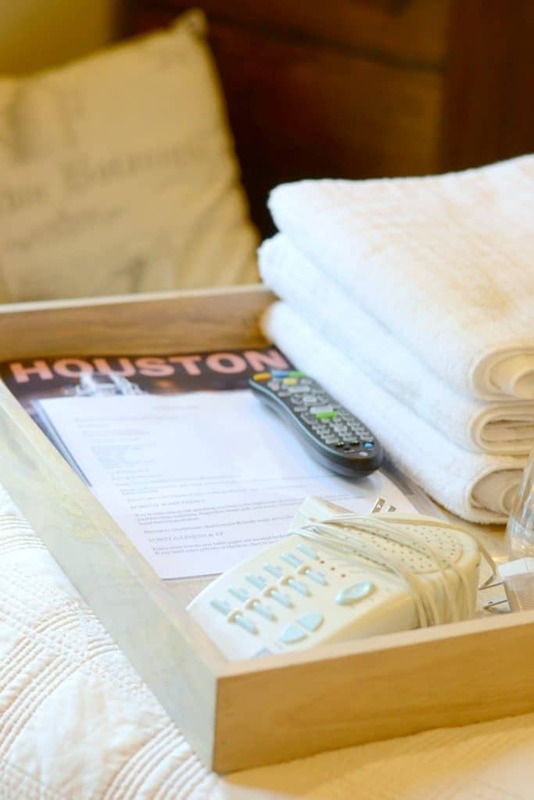 Even if your spare bedroom room is small, try to provide an empty drawer or two, a tray, an empty tabletop surface, or some closet space (with hangers) so that your guests don’t need to live out of their suitcases. A luggage rack is also a great idea if you’ve got the space. Consider including a magazine about local restaurants/activities that your guests can look through. Maybe they’ll read about a shop they’d love to check out, or a restaurant that sounds amazing. At the very least they’ll learn a little bit about your city or town. Consider a little “welcome” gift, which can include slipper socks, a local treat that they can enjoy or take home, some bagged snacks, chocolates and/or a bottle of wine. Just be sure that you choose flowers that aren’t heavily scented, or which your guests may be allergic to. These would be especially appreciated during the winter months. The first time I stayed at a luxurious hotel, I was offered my choice of linen spray for our turn down service. I never forgot how fancy that felt, and how good it smelled! Oftentimes, the guest room is the last place where we decorate, but if the walls are bare, it will won’t feel homey, regardless of what’s included in the room. 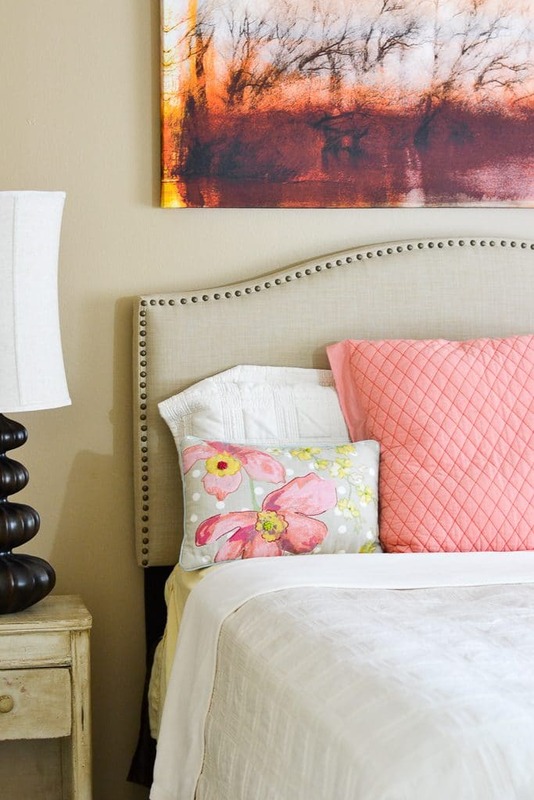 Invest in some inexpensive art, framed photos, or wall decor to complement the bedding and wall color. Do you have anything to add to these lists? What do you appreciate most when you stay at others’ homes? Thanks, friend! It’s taken me years of frequently having house guests & being a house guest to figure all this out! !